Wrong, WiFi is fantastic and has really made life easier for the connected home owner. It really is an amazing technology. As the wireless signal travels around your home, it is sensitive to different types of bottlenecks and interference as compared to a hard wired ethernet network. Physical obstructions: The number of walls the WiFi signal can pass through is determines by density of the materials used in a building’s construction. Concrete and steel walls are difficult for a signal to pass through. These structures will weaken or at times completely prevent wireless signals, this is where hard wired ethernet comes in. Interference: WiFi network operates at 2.4GHz and 5GHz band, other wireless devices using the same frequencies could cause interferences, resulting poorer WiFi receptions. Microwaves, cordless phones, baby monitors, wireless game controllers and Bluetooth devices all operate on the same wave spectrum of 2.4GHz as WiFi routers. Avoid cluttering source of interference around the router. Shared bandwidth: The bandwidth of wireless network is shared among all the wireless users, so the more users you have, the slower the network becomes. Downloading torrents, for example, might cause other users to experience a slowdown in network speed. It is a good practice to protect your WiFi network with a strong WiFi password, to prevent unauthorized user from “stealing” the bandwidth. Distance: If you're sitting near a wireless router or access point, you will experience a faster network speed. But if another person is sitting far from the wireless router or access point, the network speed of both computers will drop drastically. Speed of connected device: The achievable download and upload speed of the device connected to the WiFi network is also dependent on the device itself. A mobile phone with better processor and more advanced antennas and radios design will promise higher download and upload speed. Location: Where an Access Point or wireless router is placed also makes the difference. Place the devices in higher ground to reduce the impact of physical objects. So to summarise: WiFi is great but if you have a busy household and especially if you have teenagers living with you. 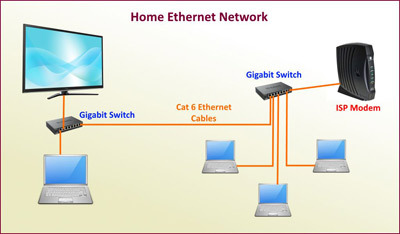 It might be a good idea to hardwire the ethernet connection to things like the TVs and your home office. This will improve the signal for any remaining WiFi enabled devices around the home.